About 95 per cent of all known animal species are invertebrates. Aknowledge of their sexual, reproductive, and development biology isessential for the effective management of species that areeconomically useful to man or are harmful to him, his crops, andlivestock. This treatise is the first to cover all aspects ofreproduction and development of the entire spectrum ofinvertebrates -- terrestrial, marine, freshwater, brackish-water,free-living, and parasitic. The chapters, by leading world expertsin their fields, are up-to-date and informative, and suggest anumber of problems for future research. 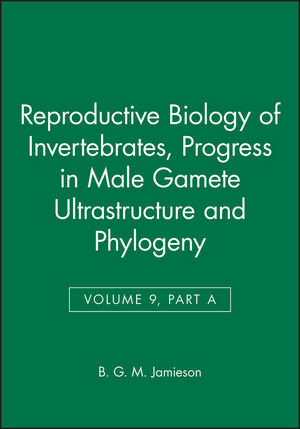 Progress in Male GameteUltrastructure and Phylogeny (issued in parts A--C) is the ninthvolume in the series. Contents Preface to the Progress Series; Preface to Volume IX,Part A; Contributors; Porifera, N. Boury-Esnault and B.G.M.Jamieson; Cnidaria and Ctenophora, Peter L. Harrison and B.G.M.Jamieson; Platyhelminthes, Nikki A. Watson; Nemertea, ?ke Franzenand Bjorn A. Afzelius; Rotifera, Giulio Melone and Marco Ferraguti;Gastrotricha, Maria Balsamo, Elena Fregni and Marco Ferraguti,Kinorhyncha, Andrey V. Adrianov and Vladimir V. Malakhov;Nematomorpha, Roberto Valvassori, Magda de Eguileor, AnnalisaGrimaldi and Giulio Lanzavecchia; Acanthocephala, MarcellaCarcupino and Bahram S. Dezfuli; Subject Index; Species Index. DR K.G. ADIYODI, formerly Professor of Reproductive Physiology andDean, Faculty of Science, Calicut University, Kerala, India andVice-Chancellor, Cochin University of Science and Technology,Kochi, is now Public Service Commissioner to Government of India,New Delhi. A distinguished invertebrate reproductive biologist, whogave the discipline of invertebrate reproductive biology a globaldistinctiveness and identity of its own, Dr. K.G. Adiyodi isFounder Secretary of the International Society of InvertebrateReproduction, Founder Editor-in-Chief of the International Journalof Invertebrate Reproduction and Development, and Founder Presidentof the Indian Society of Invertebrate Reproduction. DR RITA G ADIYODI, formerly Rhodes Visiting Fellow, SomervilleCollege, Oxford (1976-78), is Professor of Zoology at CalicutUniversity. She served as President of the Crustacean Reprobiologyand Aquaculture Bureau of India and as Vice-President of the IndianSociety of Invertebrate Reproduction. Dr. Rita Adiyodi representedIndia on the International Committee of Comparative Endocrinology.The Adiyodis have worked extensively, over the past three decades,on the endocrinology and physiology of growth and reproduction ofarthropods, chiefly crustaceans. BARRIE JAMIESON is Professor of Zoology at the Department ofZoology and Entomology, University of Queensland. He holds a B.Sc.and Ph.D. from the University of Bristol, England, and a D.Sc. fromthe University of Queensland. In 1990 he was awarded the ClarkeMedal for Research in Natural Sciences, an honour shared withThomas Henry Huxley. His chief field of research is spermatozoalultrastructure and its relevance to phylogeny but he is also anauthority on the taxonomy of earthworms and has published onbioluminescence, trematode taxonomy and life cycles, and DNA-basedphylogenetics. He has published nearly 200 scientific papers and isthe author, coauthor or editor of nine books. Porifera (N. Boury-Esnault & B. Jamieson).